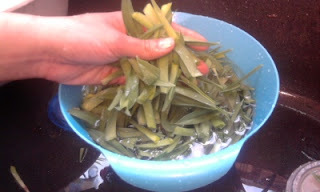 EdibleLandscaper: Eating Day lilies aaaand How I cook it. Well, this is a long overdue post. How overdue? Oh I'd say about two years. I've been meaning to write it, but day lily greens time is so short, it is pretty much over as soon as it starts! when I read that day lilies were edible. That's really funny, because I was planning to dig the darned things out until I read that article. LAFF! DERP! I'm an edible laaaaandscaper! I don't even know all the edibles! I was told by a nice lady, "If you have a plot of day lillies, you will never go hungry". Considered as a delicacy by wild food gatherers and knowledgeable chefs, the day lily has a long history in Chinese medicine and cuisine. While it's true that the flowers, tubers, and leaves are edible, I've found the leaves can only be eaten when they are very young and tender. The first year,I tried some with speculation, and it wasn't too bad. Actually it was pretty darn good, but there was just one problem. IT WAS TOUGH. Like eating a flat leaf with the texture of twine. I still kept chewing and insisted it was delicious, as the rest of my family gave me the stink-eye, and I finally said... yeah it's tough. Don't eat it. The second year, I was determined to give it another try because it DID taste good. This time, I harvested it when it was younger, and SUCCESS. The kids loved it and were begging for a second round. By the time we got around trying a third time it was too tough. Crazy, I tell you. 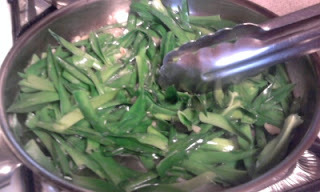 Much older and wiser, here we are at year 3.
here's a bowl of freshly cut Day lily greens. At most they are 2". Like I said, a very limited performance contract. 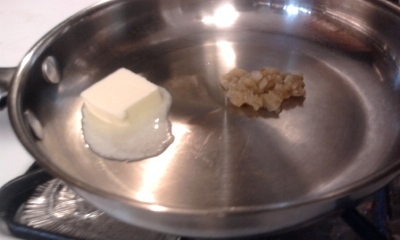 here I have a pan with butter, and minced garlic --- because everything tastes awesome with these!! 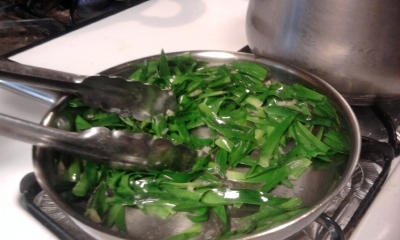 After a few minutes of cooking, you can see they are like Spinach or broccoli. 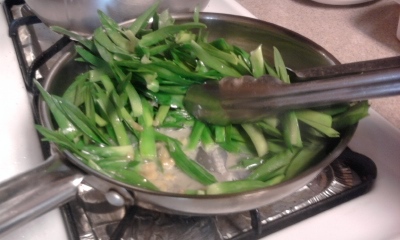 Turns an awesome shiny and VIBRANT green after cooking! 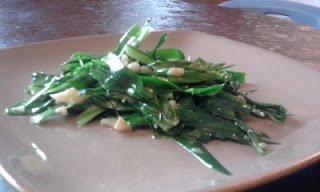 You will also notice that kind of like spinach or other greens, they've reduced to half the size. Here it is. In all it's glory.